Cardano has had a big April so far - up more than 30% in USD value in just the first two weeks of April. This helped it hit the kind of 2019 success other coins had. It had been lagging behind previously. The Cardano community has waited on hints from founder Charles Hoskinson on tech and adoption news. With little concrete dates on the horizon on upgrades, TA is showing that ADA prices might hit a bearish correction on the coin's hot April. This week, Cardano (ADA-USD) took a break from the bullish run it embarked on since March 2018, as strengthening Bitcoin (BTC-USD) prices took a toll on the crypto asset pair. This analysis piece will focus on the behavior of the ADA/BTC pair at the current levels of support, and what traders can expect in the coming weeks. CEO of IOHK, Charles Hoskinson provided some reassurance on the future of IOHK’s Cardano in an April 8 podcast. Hoskinson made the comments while speaking of the benefits of the long-awaited Shelley update. However, Hoskinson made no mention of the launch date of the Shelley-based mainnet. That leaves most of the fundamental influence on ADA/BTC market action squarely in the hands of Bitcoin, which continues to dominate market activity in the crypto market for the second week running. 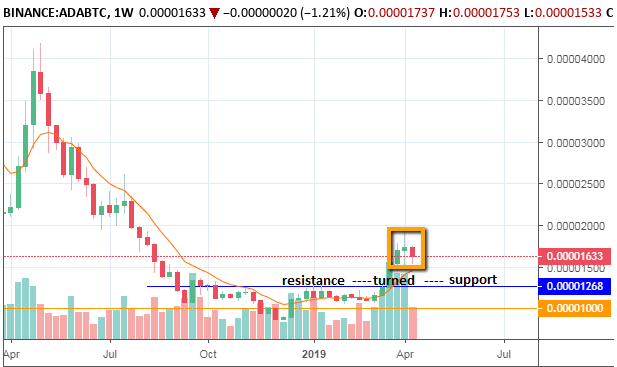 The technical outlook for ADA/BTC starts with a look at the weekly chart, where we see the triple candlestick formation that is playing out. This could possibly be an evening star pattern in evolution. However, the active candle for the week is still open. We will need to see it close as a bearish candle, with a possible closing price that is lower than the first candle in the pattern, for a definite conclusion to be made. Furthermore, we also see the blue line which formed a resistance level in the last quarter of 2018, before being broken conclusively to the upside earlier in 2019. With a price retreat on the cards, this line may possibly be tested in the near future, where it's expected to play a role reversal to function as a support line. 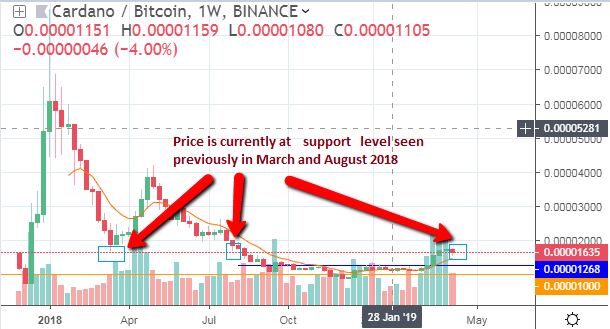 Presently, price is at 0.00001633, which is an area where ADA/BTC found support in March and August 2018. Therefore, this is an area where price has to overcome for the downward move to resume. 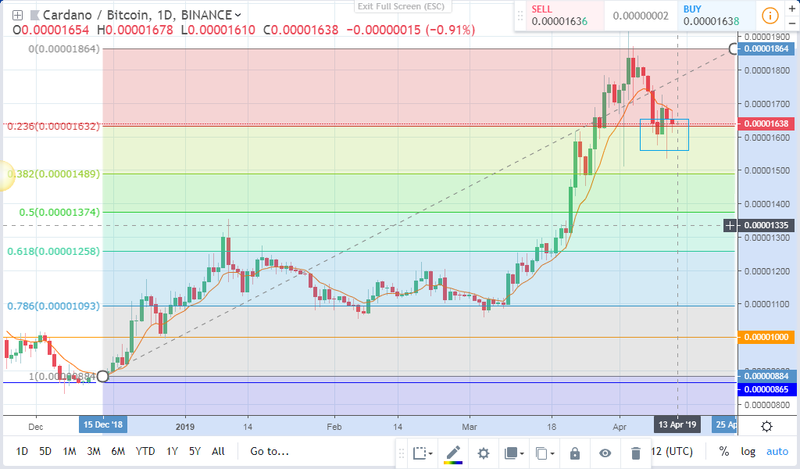 Moving down to the daily chart, we can see bullish market action for ADA/BTC which extended from the medium-term support levels seen in March 2019 at 0.000011 BTC. A Fibonacci retracement on this pair shows that price action has presently retreated to the 23.6% Fibonacci level. That level has been tested several times within the week. As trading for the current week draws to a conclusion, it remains to be seen if the present support level, already identified as a previous support in March and August 2018, will hold up or not. This is therefore a critical price level to watch, as we look at the possible price action scenarios for the next few weeks. The first scenario assumes that the present support level (where market price is currently located) will hold firm. If this occurs, this means that the evening star pattern on the weekly chart will not be complete, and any downside moves may not materialize immediately. We must take cognizance of the role that Bitcoin is playing. After surging to more than $5,400 against the USD, Bitcoin was sold off to $4,800, and then posted a slight recovery on Friday April 12 to $5000. This means that BTC is still down from its Thursday highs, and this could provide strength for ADA to push up from present support levels to resume a move to the 0.00002 BTC mark. There must be an increase in buying volumes to make this happen. The second scenario assumes that price will break the present support levels. Support for this view will have to come from a strengthening of BTC as well as maintenance of the selling pressure on the pairing that has been witnessed this week. A break of the 23.6% Fibonacci level will see a price move toward the 38.2% Fibonacci price level of 0.000015 BTC in the medium term. Long-term selling pressure will open the door toward the next long-term support on the weekly chart at 0.00001268. Long-term selling will depend on completion of the identified evening star pattern, with a close of the day 3 candle occurring below the day 1 candle. Please note: this analysis was done on a weekly chart. It takes a whole week for a candle to form, so these moves may take several weeks to play out. Entries should be made on shorter time frame charts such as the daily chart.